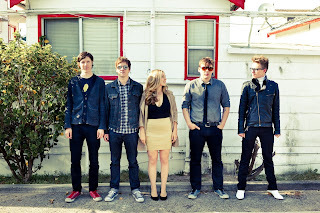 Like the idea of one of your photos being used as artwork on Gold Motel's upcoming sophomore album? The Chicago indie pop quintet is inviting you to make it happen with a new campaign that asks any fan with an Instagram account to submit photos with the tag #goldmotelalbum and a mention @goldmotel by April 15th, after which they'll review all of the submissions and select a few to make a part of the record. For more information, check out the band's latest FanBridge mailer. While they're still putting the final touches on the album, which follows up 2010's Summer House, you can get a taste right now in the form of the immensely hummable track "Leave You in Love," playable below. Another way you can get your Gold Motel fix while you wait for the record is by heading to their next Chicago show on Friday, April 27th at Metro with JC Brooks & the Uptown Sound and Blah Blah Blah. Click here for more information and tickets.